The Vancouver Condo Buzz » Tower Green at West in False Creek Vancouver Condos for Sale > Phase 2 of Master Planned West False Creek Executive Development Group Project! « UNIQUE PROJECT! 626 Alexander Railtown Courtyard Flats & City Homes in Downtown Vancouver’s Railtown Real Estate District > Only 24 Homes Available! Tower Green at West in False Creek Vancouver Condos for Sale > Phase 2 of Master Planned West False Creek Executive Development Group Project! PRESALE VANCOUVER CONDOS at Tower Green at WEST in False Creek Vancouver West Side is launching this September 2014! Don’t wait any longer and please register your interest for this exclusive and very exciting launch! Tower Green Vancouver condos is Phase II of The Residences at WEST development by Executive Group Development. The tower will be situated at West 2nd in the heart of the False Creek Village called WEST. The project will feature 177 brand new homes in the most sought after West Side Vancouver False Creek district. The affordable price point of these presale Vancouver Tower Green condo residences will be between $319,000 to $459,900. Tower Green Vancouver is central, sustainable and unequalled in value. And by registering early on their web site at www.TowerGreenLiving.com, presale homebuyers have an opportunity to purchase a brand new West Side Vancouver Tower Green at West False Creek condos with early bird pricing, incentives and exclusive promotions just for you. In addition, a brand new Sales Centre will be opening this Fall. The contemporary homes delivered by Executive Group Development are located in a prime location where you can easily walk to everything including the Seawall, cafes, restaurants, shopping and even the Aquabus. Downtown Vancouver as well as Granville Island are within minutes as is the False Creek Village Community Centre and Legacy Wine Store to name a few things. Major transit routes (including convenient access to 2 SkyTrain Stations, an 18,000 square foot Daycare facility, waterfront, seawall) are also near the Tower Green Vancouver condo site, which makes everything accessible. The Shops at WEST just steps from the West Side Vancouver Tower Green condos will feature over 43,000 square feet of street level shopping, restaurants, services and much more. You can find out more about The Shops at WEST in the Tower Green condo neighbourhood online at www.shopsatwest.com. If you are looking for a commercial spot, both Phase 1 and 2 have opportunities right now. This is one of the most fascinating and exciting new communities in the city. Floor plans are coming soon! They should be available during the official launch in late summer/early fall. COMING SOON! 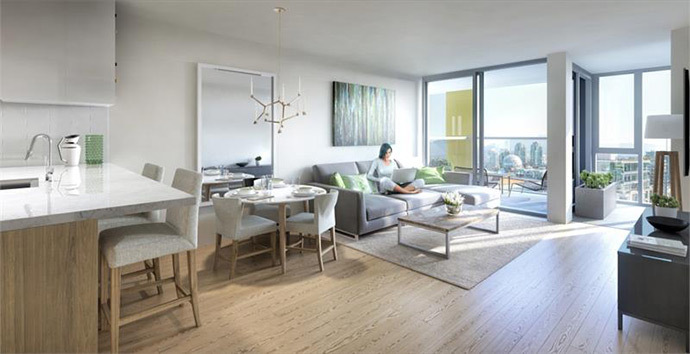 From $319,900 to $459,900 > Tower Green at West in False Creek Vancouver features a true waterfront community location with a fine selection of 100 homes. VIP Register today for early bird pricing and special grand opening promotions. PRESALES LAUNCH THIS FALL 2014! Phase 2 Tower Green at West False Creek Vancouver condo living is central, sustainable, unequally value in this West Side community by Executive Development Group. Beautifully landscaped residential podiums on 15 and 16 storey towers at WEST Vancouver Tower Green condos will forever change the skyline around this False Creek Village neighbourhood. The stunning modern architecture is by Walter Francl Architects Inc and Atmosphere Interior Design of Vancouver will round out the team. The Tower Green Vancouver West Side condos will be built to LEED Silver equivalency and there will be distinctive and welcoming lobby entrance with contemporary finishes and textures. The on-site amenities at Tower Green at WEST False Creek Village will feature a state of the art fitness centre, resident lounge, personal workspace nooks, broadband WiFi services and a common roof terrace with lounge space and barbeque area. All windows are thermally insulated and double glazed and all appliances are Energy Star rated wherever applicable. There are low flow toilets, shower heads and faucets for water sustainability in addition to a sustainable rainwater catchment. On site is a Zipcar car share program The building itself at the presale Vancouver Tower Green at WEST False Creek Village condos will feature FOB access security system with restricted floor access, in suite TV monitored entry system and uniformed concierge desk at the lobby. The bathrooms at the beautiful False Creek Village Vancouver Tower Green condominiums will feature imported Vicostone quartz Carrara counters, exotic wood veneer vanity with under mount basins, custom medicine cabinet with deep drawers and glass walk in shower with polished chrome faucets. As well, the elegant retreats at the Vancouver False Creek Village condominiums will have sophisticated textured polished stone and glass mosaic vanity wall tilework and accent tile for the tower surrounds, a deep profile soaker tub, large format porcelain floor tile work and dual vanities in some floor plans. The kitchens at the new Vancouver False Creek presale condos will include similar high-end Quartz Carrara counters, Euro style white high gloss acrylic upper cabinets and exotic wood veneer lower cabinetry with soft close drawer mechanisms and built in wine closet. The kitchens at the new Tower Green at WEST Vancouver condos will feature white polished ceramic tiles, marble tiled backsplashes, under mount sink, garbage disposal and Venmar Italian inspired chimney style hood fan and recessed halogen under cabinet lights. The kitchens also have a European collection of stainless steel appliances including a Blomberg fridge/freezer, Fulgor Milano shallow profile ceramic cook top and built in convection oven and dishwasher. There are options for your wide plank flooring in the living areas and al homes come with solar shade roller blinds and controlled electric baseboard heating. There are frosted full height sliding glass dividers in dens and junior one bedroom floor plans. 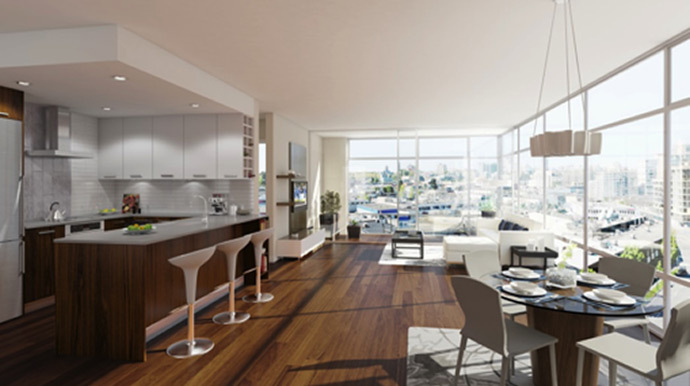 A new phase at the WEST Vancouver condos in False Creek are coming soon! Called the Vancouver Tower Green condos at WEST, registration is already underway for this popular False Creek Village neighbourhood. Featuring over 100 residences priced from $309,900, the new Vancouver Tower Green Condos at WEST are located just steps away from the Seawall, tonnes of services and amenities in addition to downtown Vancouver. The stylish finishes include such things at quartz counters, marble tiled backsplashes, and European appliance set. Onsite amenities at the WEST Tower Green Vancouver condos include a technology lounge, fitness centre gym and a large daycare facility, ideal for young families. When complete, WEST will add more than forty three thousand square feet of new retail space as well as a restaurant too! Find out more about the Tower Green at WEST Vancouver condo project today by registering your interest online at: www.TowerGreenLiving.com. The project site location is at 195 West 2nd Avenue Vancouver (at Columbia Street). Be a VIP today as the wait is now over. Coming August 2014, the Tower Green at WEST Vancouver condos is Phase 2 at this unique and centrally located neighbourhood by Executive Group Development. The sustainable residences are unequally in terms of location and value. The False Creek Vancouver area is changing rapidly so get in on a ground level opportunity today with prices starting from just $319,000. The sales centre for the False Creek Vancouver Tower Green at WEST condos will be situated at 195 West 2nd Avenue Vancouver (West 2nd and Columbia Street). From their web site: The evolution of an outstanding neighbourhood begins with vision. One that carefully balances residential, retail and community components, ensuring its residents are never more than a few steps from everything they need on a day-to-day basis. Vancouver’s False Creek Village neighbourhood does exactly this. Tower Green Vancouver condos is central to a multi-phase residential and retail project called WEST designed and developed by The Executive Group in the center of the False Creek Village. WEST Vancouver False Creek master planned development spans a full city block and is exceptional in every way imaginable. 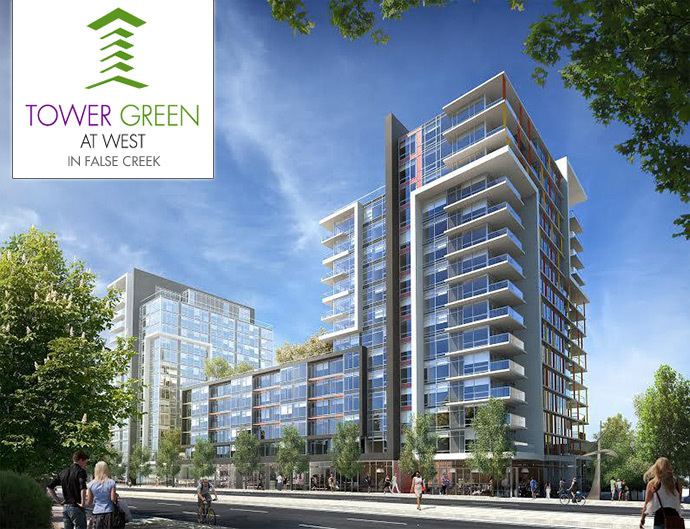 In the middle of it all and steps from the waterfront is Tower Green at WEST in False Creek Vancouver. From its incredible design and location, to over 43,000 square feet of fashionable retail space and restaurants planned at street level, Tower Green Vancouver condos is the face of the Village neighborhood. Bold, Balanced, Central and Sustainable. Tower Green is the centerpiece of the new False Creek Village with completion scheduled for Late 2016.